David Drew, Member of Parliament for Stroud visited local businesses within his constituency. Having been an integral part of the Stroud community for the last 35 years. David is renowned for his passion within the community, having been a school teacher, senior lecturer within Gloucestershire and Chairman of Forest Green Rovers FC between 2010 and 2017. David took the time to listen and pledge his support for small businesses in Stroud by visiting Westend Office Suites and Market Dojo. 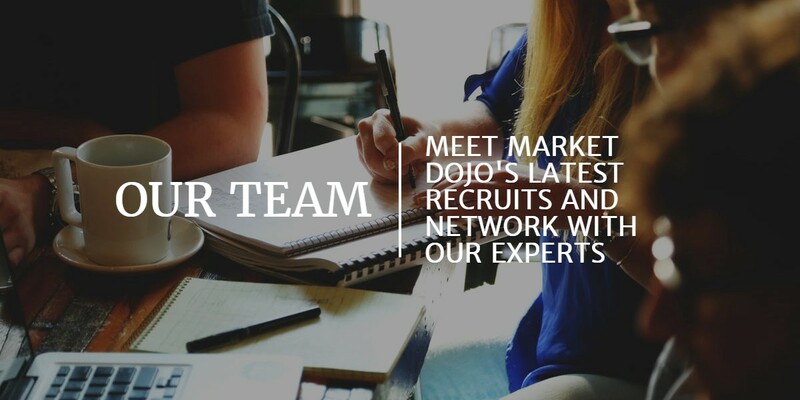 Market Dojo is a successful eSourcing software business offering procurement professionals the ability to save time and money with their range of easy to use solutions. David Drew teamed up with Russell Warner, Business Owner of Westend Office Suites and advocate of Small & Medium sized businesses within Stroud to discuss the challenges faced in the local area. Combining their years of experience, they discussed the effects of Brexit, barriers to recruitment locally and the importance of creating a harmonious professional community within the Cotswolds. It was agreed that Brexit has impacted businesses nationally with uncertainty delaying budgetary investments and focusing many on cost-cutting and savings. Whilst this has caused a lot of uncertainty within the market and economy, Brexit has seen a rise in new opportunities globally for solutions such as Market Dojo. 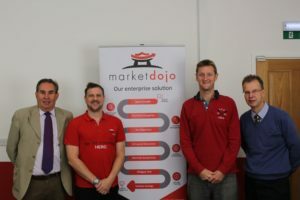 Firstly Market Dojo helps organisations reduce costs and increase efficiencies in their supply chain. Also as the pound has become weaker in the global market, innovative companies such as Market Dojo are more affordable abroad and can compete more easily in new markets. Another challenge discussed for Small and Medium businesses within Gloucestershire was the need for office space within commutable distances of the populated areas of Cheltenham and Bristol. As the offices are situated just off the M5’s Junction 13, it is a perfect location to attract the best talent from the local areas. The Stroud area is often overlooked as a possible rural location although offers many advantages with excellent transport routes combined with a relaxing environment. Westend Office Suites have been able to offer and deliver with luxurious yet affordable office suites that combine refurbished farm buildings with a contemporary modern design. This has created a professional atmosphere within the breathtaking Cotswold countryside. The final challenge discussed was that of finding staff within this rural community. Whilst easily commutable to the larger nearby cities and towns, finding staff and training a workforce within the area is seen as many to be the major test in growing a business within the local area. Given Market Dojos growth rate, and employee benefits, combined with a relaxing office environment, they have done well to attract and retain great talent. However, recruitment still poses one of the greatest challenges. “Since starting Westend Office Suites in 2009. I’ve seen many enterprises. There are now over 150 local employees directly managed from companies located at Westend Office Suites most work in the local community and never actually come to the site. 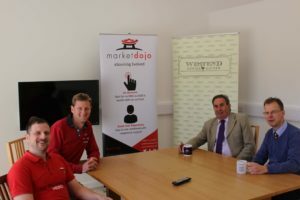 Market Dojo is a good example of a successful growing company having their first office at Westend Office Suites just over four years ago and taking on their first employee to currently employing 10 staff and with plans to continue to grow ambitiously.